The Philippines has a lot of holidays. Prepare yourself and your business with our 2015 Philippine Holiday Calendar! 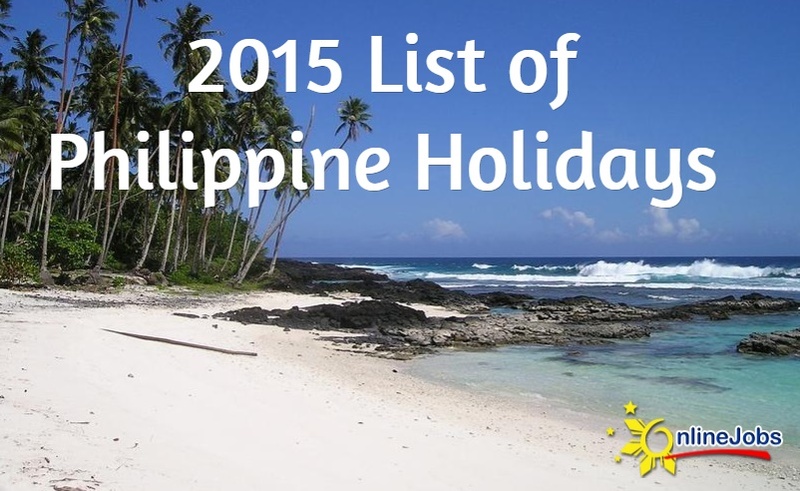 This list is based from the holiday calendar released by the Philippine government. We’ll update this as soon as any new developments come in. Are we elected to pay out VAs even if they don’t work? This is my first VA so I don’t know what is expected our customary. Are we expected to pay our VAs for these holidays even if they don’t work? This is my first VA, so I am not sure what is expected our customary. It is a customary since most Philippine companies do recognize these holidays, especially the regular holidays. But if you need your VA to work over some of the holidays listed on the calendar, the best thing to do would be to negotiate with them on what holidays you are willing to compromise on. I appreciate this list; however, I’m a bit confused due to time zone differences. I’m PST these dates would actually be the day prior for me? Yes. The holidays listed here would be the day prior to you since the Philippines is 15 hours ahead. Thanks. My VA has always been good about warning me of these, but it’s nice to have something to post on my bulletin board. If your VA wants to work on holidays, do you pay them extra? If so, how much extra? Time and a half? Double pay? It’s really up to you and what you work out with them. We don’t pay extra for holidays. However, it might be a good way to build rapport with your worker. If they want to work more, harder, longer, support them in it. I’ve been using OnlineJobs for quite some time now. This list has been extremely helpful. When I first began, I gave holidays off for normal pay and working holidays for extra pay. I did this to establish rapport and encourage working holidays. However, I feel new holidays or nonworking days are added constantly. There was just one literally declared. Unfortunately this will cause me to change the pay structure. To deal with this you might just do what American employers often do; create a list now of holidays for which you’ll pay, and those for which you’ll pay extra. Set it right now and then leave it at that. It’s not necessary to keep up with all the holidays…you’re right…there are a ton! Okay great suggestion! That is what I will do! Thank you! A question, would you recommend giving your employees leave dates? For example, in my country you get 20 days you can take off during the year + days off on national days. I know a lot of people do what you’re suggesting. When we hire people, we tell them we don’t have any set number of leave days. They’re free to take whatever leave/sick days they need/want, just don’t take advantage of us. We also want to know ahead of time if they’re taking days off, or if they’re sick, we want to know asap. It has worked for us for 9 years now. Our method probably won’t work for everyone. Hi.. I would like to apply some home base job .. but its really hard to get one.. can anyone tell me how to be an VA? I am now doing classified ads and blog posting in my house but in the account of my wife. I need for my own..